Last October, Phast Phreddie the Boogaloo Omnibus was asked to DJ the dance party section of the Internet Archive’s annual celebration in San Francisco. It went so well, that he was asked back this year for its celebratory event held on October 11. Phast Phreddie the Boogaloo Omnibus works the dance portion of the Internet Archive Party. The Internet Archive is a non-profit entity whose mission is to make as much information available on the internet as possible, for free. Or, as they like to put it, universal access to all knowledge. This year’s theme was The Twentieth Century, and the Archive touted its vast gathering of all sorts of information from that time period now on its website–books, movies, news papers, sound recordings, etc.–during its gathering of affiliates, partners, employees and associates in the Great Room on Funston Avenue. Chas Gaudi swings his 78s at the Internet Archive party. One of the fine things that the Internet Archive is responsible for is the Great 78 Project. The IA is sponsoring the digitization of tens of thousands of 78s (most of them funneled to the project by the ARChive of Contemporary Music). 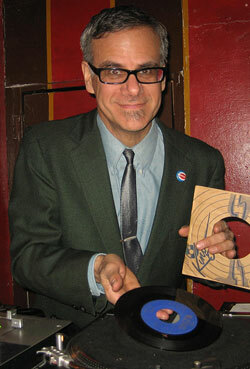 In order to emphasize this, our pal Chas Gowdy played 78s in the back yard during the early portion of the evening. Also going on there was George Blood, the man responsible for digitizing the 78s in Philadelphia, showcasing his four tone-armed turntable, one of the ones used for this project. There were taco trucks, drinks and hands-on demos of such things as old computer games and virtual reality. George Blood’s 4 tone-armed turntable. And there were taco trucks. Gooood taco trucks! 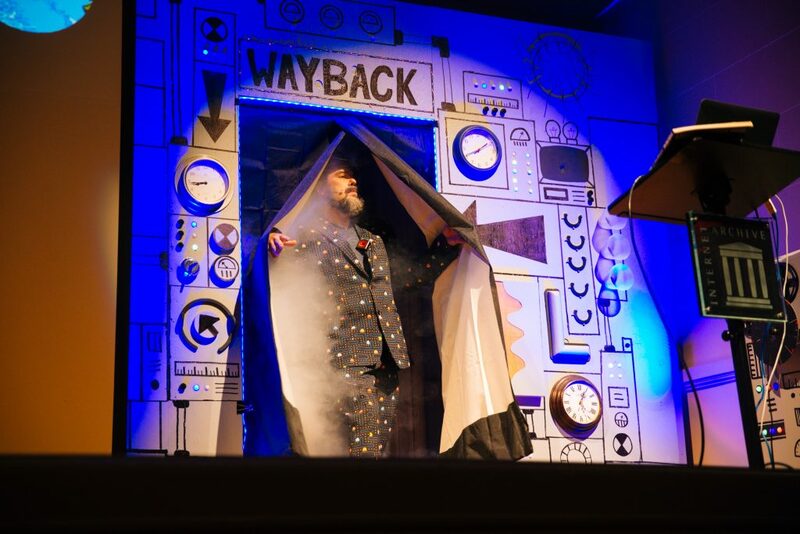 The Boogaloo Bag writers were busy getting ready for the dance portion of the evening and did not see very much of the presentation in the Great Room, but suffice it to say, the Wayback Machine that was built for the event was a genius addition to the program. It is difficult to describe, but we will try: it looked like a great big box with a curtain. The host Jason Scott, or a speaker, would adjust a nob until it read a date, then lights would blink, smoke would come out of the top and a guest speaker would walk through the curtain and discuss something that happened on that date. The whole program can be checked out at the Internet Archive blog. Chas Gaudi gets a vist from Alec Palao at the Internet Archive party. Chas Gaudi, Phast Phreddie the Boogaloo Omnibus and Otto Von Stroheim swing at the Internet Archive Party. After the presentation, all attendees were given a gift (knit caps with IA logo) and ice cream bars and directed to the back yard, where Phast Phreddie the Boogaloo Omnibus played some swingin’ records and was very pleased that some of his local friends were able to come out and dig the scene, including Otto Von Stroheim, Big Kahuna of the Tiki Oasis; and Alec Palao, genius reissue maven for Ace Records (UK). None of these records are for sale. Some of them have links to the youtubes clips so you may dig them in the privacy of your own head!